Today was Life Chain. Life Chain is the first Sunday in October where many can gather to silently pray, usually single file along the street, and hold prolife signs for one hour. Right after, your church group can pray together for 30 minutes. And that’s it. No hocus pocus, no protesting…just quiet prayer with other like-minded prolife individuals. Our local television station came by to take some video, last year a reporter happened to drive by and took photos of us for the local news. The abortion mill was closed today. 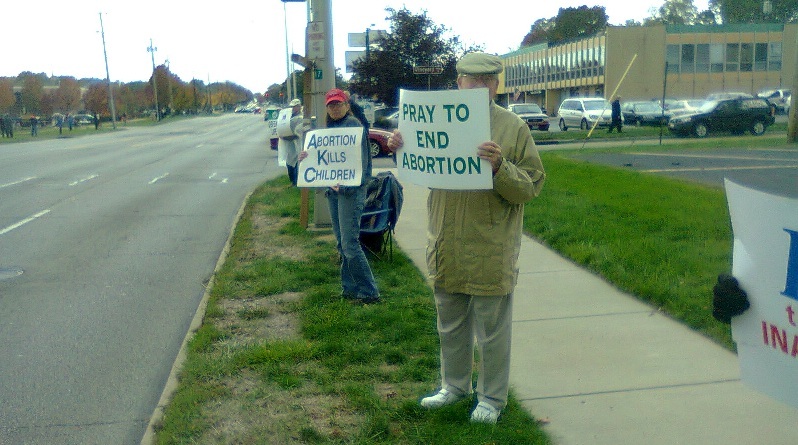 An elderly man walked with a limp, dragging one foot with much effort across the part of the abortion mill’s parking lot nearest the street, furthest from the mill. While most of us know not to touch the asphalt, this man saw a faster way to get from Point A to Point B because it’s so hard for him to walk. Very shortly after, two police cars show up to chastise the man; you see, someone was hiding in the mill with their car parked where we could not see it and called the police. Dirty pool. We had no agenda to disrupt their property but they can kill unborn children. Irony or insanity? We were told by the director that our Life Chain location used to be 10K strong. Even though we have nice turn outs, sometimes up to 3K people, somewhere along the line our little city has lost its fervor for just about everything. It’s as if this half empty city has given up and are just going through motions of day-to-day living, or better said…getting by. While I am thankful for our turn out today I am still perplexed and saddened by how most people just don’t care to participate for anything. But I am thankful for the faithful! Praise God, many thousands drove past to see our Chain of Life.